You are here: Home / Military & Real Estate / Military Moves: Are You Protected? 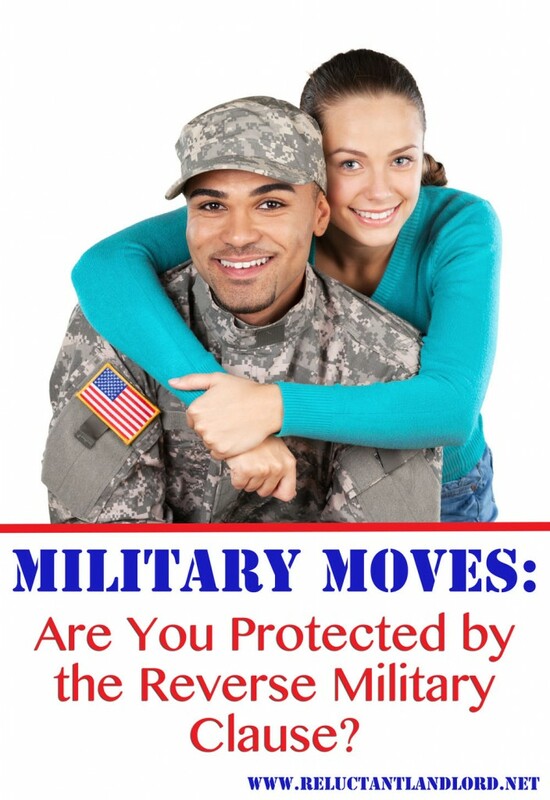 Military Moves: Are You Protected? Do you own a home? Are you a landlord or thinking about becoming one? Do you think you might at some point move back into your home? If so, are you protected? Do you believe a lease should be equally fair to both sides or should one side have more power than the other? Have you protected yourself from being forced to either buy your tenant out of the lease or wait until the lease is up should you need to move back into the home? I am a big believer that a lease should be fair for all parties. At the end of the day life happens and one needs an out. Our buy out clause allows both sides to buy the other one out with the same rules. As a landlord, I have never used it, but my tenants have used it multiple times. I have actually lost count of how many times it has been used. Therefore, I do the same with our military lease. This way everyone is EQUALLY protected. As anyone who is active duty military knows, you go where the military sends you when you are sent! Of course, it is usually with little notice and never when predicted. Are You Protected by the Reverse Military Clause? One item that comes up in military leases is the reverse military clause. This clause, while very controversial, is needed by everyone who is active duty. The reverse military clause allows owners to move back in to their homes should they receive orders to that location. I truly feel that it is fair because it would only be able to be used with orders — same as any tenant. So really, the landlord is not asking for anything more than equal treatment. The reverse military clause also allows a landlord to provide notice to their tenant to move back into the home. The reason I hold this dear to my heart is that our last move was less than fun. We got last minute orders to a different duty station than planned. While things eventually worked out, it was two months of couch surfing — as a couple — because the purchase of our house fell through days before we were supposed to close. It almost killed us, and it was just two adults with a kitten. Therefore, I have NO plans to ever move to an area with 4+ kids and X+ homes in the area and not be able to move into my home. What does this mean for your tenants? Absolutely nothing unless you move back into the area. If you are moving back, you provide the notice required by the lease. They obviously have the right to not sign the lease over this clause, but I personally have not had a single person have an issue with the clause. What are you experiences and thoughts regarding a reverse military clause? I would never rent a home with something like this in the lease. It’s one thing to have the tenant enact the military clause and move…then the landlord is merely responsible for advertising the home to find a new tenant. On the flip side, when enacting this reverse military clause you are requiring a family to not only find a new home but to also have to move the entire contents of their home, which obviously the military will not cover if you are not on PCS orders. If this is a military family renting then they would most likely be in the middle of workups or a deployment which only adds to the stress of this life and quite possibly a spouse moving on her (or his own). So no, in no way do I see this “reverse military clause” as being equal in any way to the protection the actual SCRA military clause provides. Please respond to this question then: we are that family for home dad is being sent off to war zone and we are being required to move back to our home earlier than expected with three children, one of whom has special needs. I will not couch surf. Our tenant will of course be given 60 days notice but I would like to give them even more so that they can at least start looking. The scary part is, I can’t financially have the move out earlier than the 60 days. Is there any coverage for me there? Can I say, “please know this is coming but you have between month X and month Y to move” ? Or must I keep my mouth shut until exactly 60 days before? While I am not a lawyer or offering legal advice. I do recommend that you review your lease and make sure you have the reverse military provision in your lease. Unfortunately the FEDERAL SCRA as I understand it is not both ways. If you don’t have that protection in your lease, than you are not guaranteed being allowed to move back into your home. 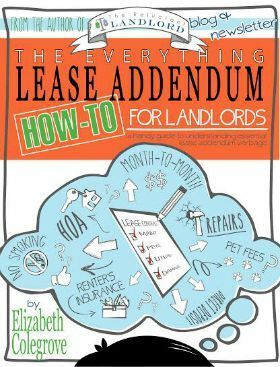 If this is not in your lease, I discuss other options in my post, How to Ask Your Tenant to Move out Early. As to your question about notice. That is a very sticky situation and everyone has their own opinion. While I am a HUGE believer in treating other how I wish to be treated and a believer of paying it forward(one of the reasons I started this site), I have become jaded over the years. The number one lesson that I have learned the hard way, is to never put my rental finances or family financial position at risk due to a gesture of kindness. Therefore, while I cannot offer any advice because at the end of the day you know what you are comfortable and is best for you and your family. I personally would follow the letter of the lease and the clause. I know my personal lease provides ways to enforce if they decided to leave earlier, it would be a lot messier than the situation not coming up in the first place. Hope this helps! Good luck with whatever you decide. PS- While I am only providing my thoughts and feels as nothing other than an experience aka jaded landlord (i.e. no legal advice). Don’t forget that JAG is a great starting place for legal advice.